A Signed and Sealed Certificate Of Credential. 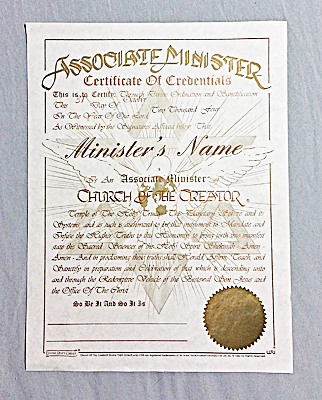 COTC Associate Minister Certificate of Ordination. 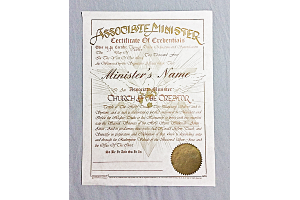 Replacement Credential due to name change, loss, damage or other circumstances requiring replacement of the original Credential issued upon Ordination. Purchase requires specific information relative full legal name, documentation of name change, date of birth, Ordinating Minister, reason for need of replacenent. Suggest contact with COTC National Office via email or Contact Form, providing details necessary to verify above information in addition to fee payment. Were a group of volunteers and starting a new scheme in our community. Your site offered us with useful info to paintings on. Yo8&7u21#;ve done an impressive activity and our entire group might be grateful to you.